The cooling fabrics market was valued at US$ 1.92 Bn in 2017 and is anticipated to expand at a CAGR of 10.5% during the forecast period, according to a new report titled ‘Cooling Fabrics Market - Global Industry Analysis, Size, Share, Growth, Trends, and Forecast, 2018–2026’ published by Transparency Market Research (TMR) Cooling fabric is a new and innovative product in the textile industry that offers cool, comfortable, and soft texture next to the skin. These fabrics are made of natural as well as synthetic textiles. They can even be worn by those sensitive to synthetic materials. Technical textiles account for 27.0% share of the global textile industry. The share of these textiles stands at up to 50% in some developed economies. However, it is less than 20% in India. The global textile and apparel industry is estimated to expand at a rapid pace due to innovation and technological developments. Key factors driving the global textile market are post-recession economic revival; rise in demand for non-woven disposable textile products; increase in demand for textiles in developing regions, particularly in several countries in Asia Pacific; and growth in demand for environment-friendly fibers. Research and development of new technologies is one of the major factors boosting the textile industry. Positive economic conditions enable foreign investments. This provides the means for research and development and also increases the purchasing power of consumers. Labor and manufacturing costs are low in developing countries. Therefore, final products are also cheaper compared to that in developed regions. Currently, production facilities of large players in the cooling fabrics market are located throughout Europe, North America, and Asia Pacific. There is little to no presence in Latin America and Middle East & Africa. However, these regions have the presence of established distribution networks. 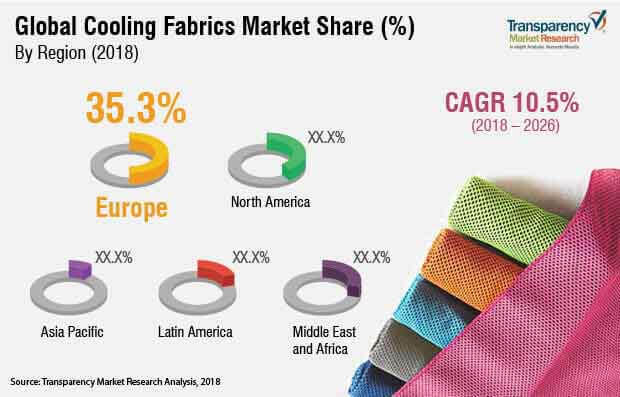 Demand for cooling fabrics is high in developed regions such as Europe and North America; however, increase in demand in developing economies is expected to provide further impetus to the global cooling fabrics market. The global population has been increasing steadily. According to statistics from the UN, population growth is especially high in urban areas. Consumers are exposed to new technologies through advertisements and promotions. Increase in spending power on luxury items such as designer clothing, branded apparel, and technical textiles is a key factor driving the global textile market. Demand for textiles and apparel is increasing due to factors such as improvement in lifestyle of consumers, rise in urbanization, growth in trend of branded clothing, and increase in awareness about high-end technology. Rise in standard of living, high demand for technological advancements in the sports sector, and growth in per capita expenditure on apparel are some of the factors propelling the demand for cooling fabrics. Increase in consumer demand for smart textiles is primarily driven by developed regions such as the EU-28, the U.S., Japan, and Australia. In Europe, countries such as Germany, Norway, Ireland, Sweden, the U.K., Denmark, and Belgium are leading consumers of smart apparel and cooling fabrics. However, countries such as China, India, Russia, and Brazil are emerging as apparel retail markets. These countries are expected to provide lucrative opportunities to the cooling fabrics market in the near future. Technological innovations leading to the production of cooling fabrics are primarily carried out in North America and Europe. These regions produce different types of fabrics. North America and Europe also procure raw materials (fibers, textile coatings, etc.) required for the production of cooling fabrics from other regions. Furthermore, leading players in the market operate their production facilities in North America and Europe. As a result, the production of cooling fabrics has been localized to these regions. Asia Pacific, a major hub of textile manufacturing, is currently lagging in terms of production and consumption of cooling fabrics. Several players offer textile services such as weaving, dyeing, and wicking – these are used in the process of manufacture of cooling fabrics – in the region. However, many of these players lack proper technology and technical expertise. Therefore, these players offer fabric products or specialty fibers (used as raw materials in the making of cooling fabrics) to other leading players and brands. Currently, majority of cooling fabrics are made of synthetic textiles. However, consumer preference is shifting toward the usage of natural textiles such as cotton. Combination of cooling technologies such as polymer coatings, use of specialty fabrics, etc. with different knitting techniques and structures allows manufacturers ease of production of cooling fabrics, in case of pure- and blended-synthetic textiles. However, the same cannot be achieved with natural textiles without difficulty. Thus, manufacturers are constantly innovating their products based on consumer demand. However, rapidly changing consumer preferences and trends, need for manufacturers to cater to consumer demand, and lack of proper technologies in developing regions are estimated to negatively impact the cooling fabrics market. The global cooling fabrics market is moderately consolidated, with a few large companies holding significant market share. Small players pose little threat to established players. Companies with an integrated business structure have the advantage of carrying out production as per requirements. Furthermore, there are chances of new players entering the market in the near future. Thus, the degree of competition is expected to remain high.